Our many years of experience with the implementation of complex architectures and the safeguarding of the affiliated operation enables us today to draw on a pool of best practice business scenarios. Thanks to our expertise, we are able to ensure that your SAP operation is both continuous and cost-optimized. Our selective business models can be adapted to your individual needs at any time. 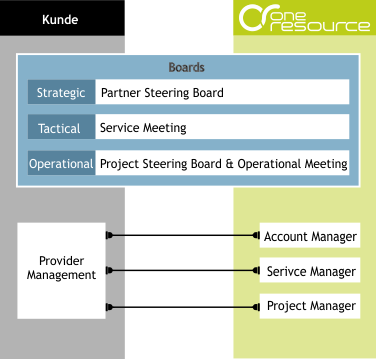 Focus on your core competencies and leave the SAP system operation to oneresource. We will support you in finding the right service levels to suit your needs. Be it for normal or extended 24/7 business hours, we offer you a “carefree package”. With the newly designed “oneCloud” outsourcing solution for the high-end midmarket, we offer you state-of-the-art technologies and well-honed business processes. The five standardized service levels address the different requirements of our customers. The data management and processing is safeguarded in Switzerland at all times. In medium-sized Swiss companies the number of IT staff, who are responsible for the operation, is generally designed for a normal operation of 5x10 hours and the establishment of dedicated SAP basis competences, including substitution and stand-by duty regulations, is very expensive. 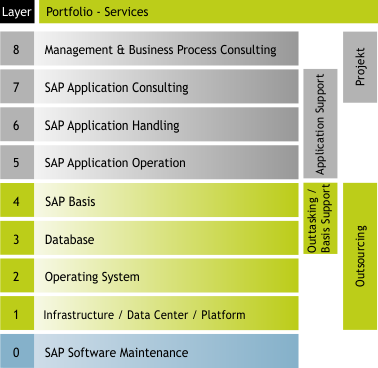 We provide our customers with a professional SAP COE (Centre of Excellence) operating team as an “extended workbench”. Whether for the normal or the extended 24/7 business hours: we offer you an extension of your IT team with our well-coordinated SAP Basis Team, which is able to draw on the oneresource application consultants at any time, if required. 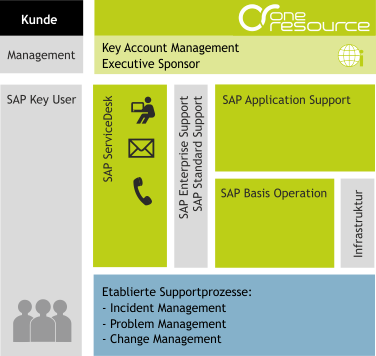 oneresource provides the customer with an SAP ServiceDesk, which is operated solely by SAP specialists. We personally take your requests and process them both professionally and efficiently. This service gives you access to all oneresource specialists – be it with respect to technology or applications – thus supplementing your internal support organization with an extended team. Defined SLAs form the basis for a mutual cooperation. With the SAP Application Support Services we relieve the pressure of your day-to-day business by receiving your application-related faults and enquiries at our oneresource SAP ServiceDesk and processing them within the agreed response time. Our SAP ServiceDesk employs only SAP specialists, who have a very high first call resolution rate and who are able to draw on additional experts, if required. In addition, as a customer you benefit from a service manager assigned to you, who is responsible for the provision of all agreed services as your single point of contact. Are you looking after and are you responsible for your own SAP systems, but would like to be flexible in the event of holiday absences of your staff? Do you want security and to be able to draw on a reliable partner at any time in order to cope with peaks? Are you planning your own SAP Basis Resources and require expert support? We offer flexible, reliable, expert security on which you can draw at any time. Do you want to be in the good hands of a reliable partner with respect to any questions relating to the issue of SAP licences and the long-term maintenance of the software? Let us advise you from the start in order to obtain a license model that has been optimally tailored to your needs; we will look after you over the course of its life cycle, be it in the Enterprise Support or the Standard Support.